In the contemporary world with its abundance of visual experience, with the pictorial language of communication reigning supreme, with the almost unconstrained and instant accessibility of iconographic material, an exposition piece of architecture will only be attractive insofar it can offer perceptual sensations attainable only through direct, unmediated exposure to out-of-the-ordinary, singular stimuli, insofar it can provide a quality of experience born out of the chemistry of inter-sensory stimulation. 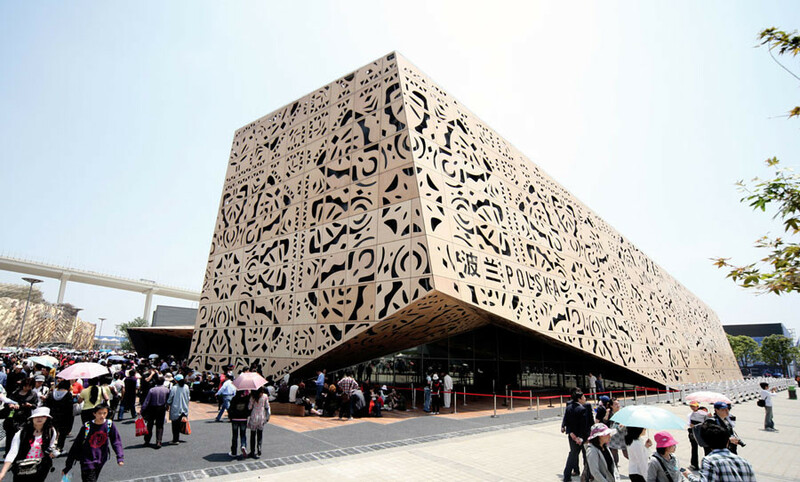 Given the nature of the exposition, the exhibition facility has to denote, by its esthetic distinctiveness, the country of origin, has to constitute, by the strength of its stylistic connotations, an evocative, recognizable and memorable cultural ideogram. In our design, the cultural idiom is primarily conveyed through the theme, the motif of folk-art paper cut-out. Or, more precisely, through a rendering of the motif, a transcription of an elementary esthetic code into the contemporary language of architectural décor. The transcription rationale was twofold. First of all, we did not wish the design to be literally folklorish, a mechanical multiplication of convention-approved set patterns. The intention was for the structure décor to draw on and make reference to tradition, but ultimately to be that tradition’s contemporary reinterpretation, a creative extension into the present day by way of inspiration rather than replication. 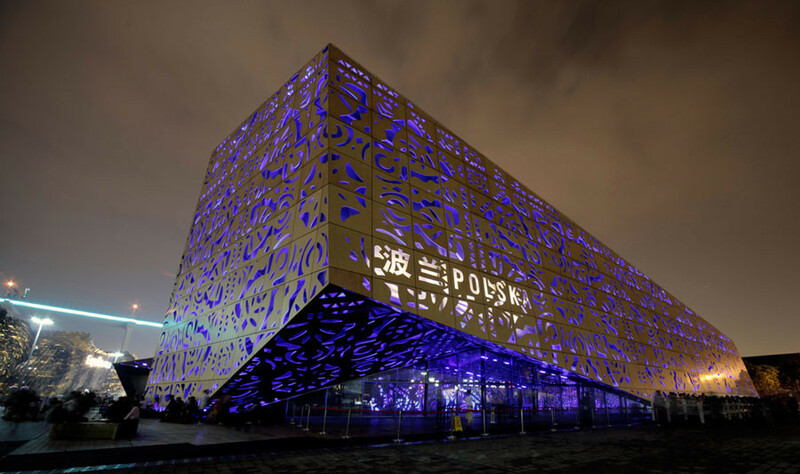 Secondly, we aspired to make the structure in its own right, in a purely architectural dimension, a significant landmark, a showcase of Polish design achievements. 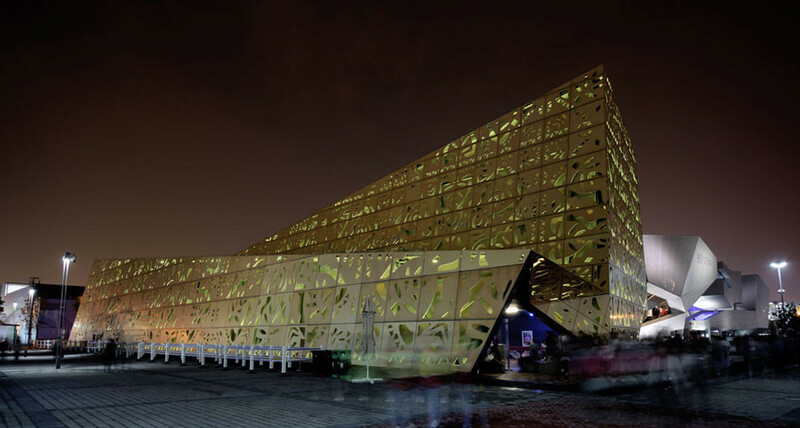 That it should be an attractive, eye-catching exterior both in daylight, against the panorama of other Expo facilities, as well as a mesmerizing experience at night with the edifice drawn by the multi-colored light seeping through the cut-out patterns. And reversely, that it should provide inside visitors with comparable experience by shaping the outer skin patterning in such a way that the sun rays shining through would chisel, by light and shade, the space under the vault. The structure’s overall shape, with many slanting planes, on the one hand complements and rounds out, by the suggestion of a folded sheet of paper, the ‘cut-out’ narrative, on the other creates inside a geometrically intriguing and flexible space that can be creatively apportioned, by inner divisions, to different exhibition, performance and utility functions and uses. The outside structure of the pavilion and its reflection in the proposed arrangement of its inside functions impose on the visitors taking and following a route which is consistent with the logic of the building. 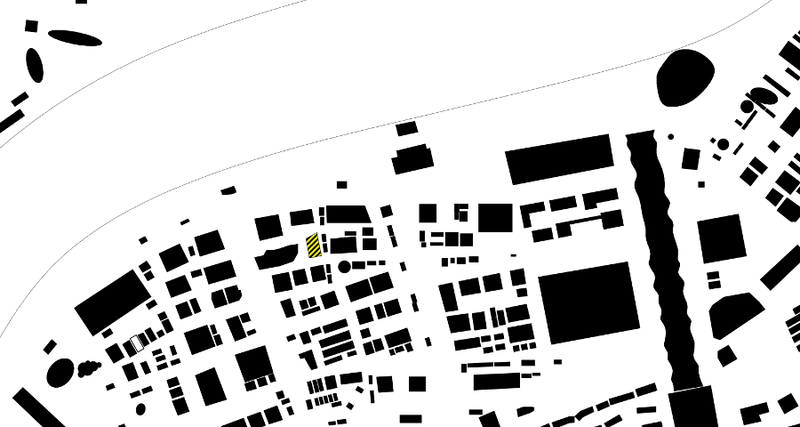 The entranceway – an interlude between an inside and outside body of the construction, is accessible from the square marked out between the pavilions. 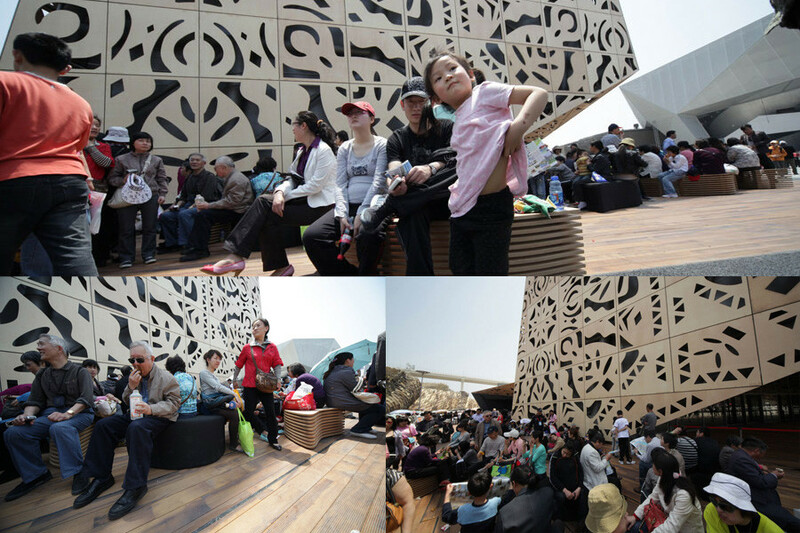 The partial roof created by the fold in the building, allows for arranging an open-air restaurant as well as for providing the queues of visitors a shelter from the elements. The entrance opens onto the hall containing the information centre, a restaurant and a shop. Next the visitors proceed to the main, full-height exhibition area of the pavilion. It is the space painted with the light filtering through the cut-out patterns of the elevation creating a ‘chiaroscuro’ effect. 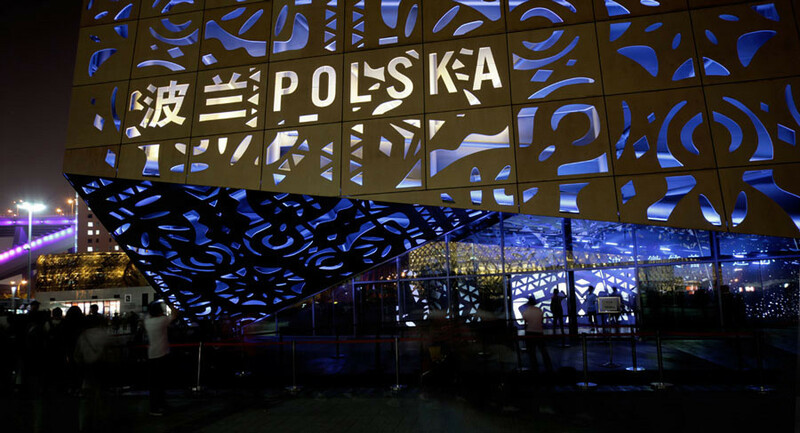 Consequently, the interior of the building will create a background for scheduled performances and presentations, e.g.directly connected with depicting the life of a typical Polish city. 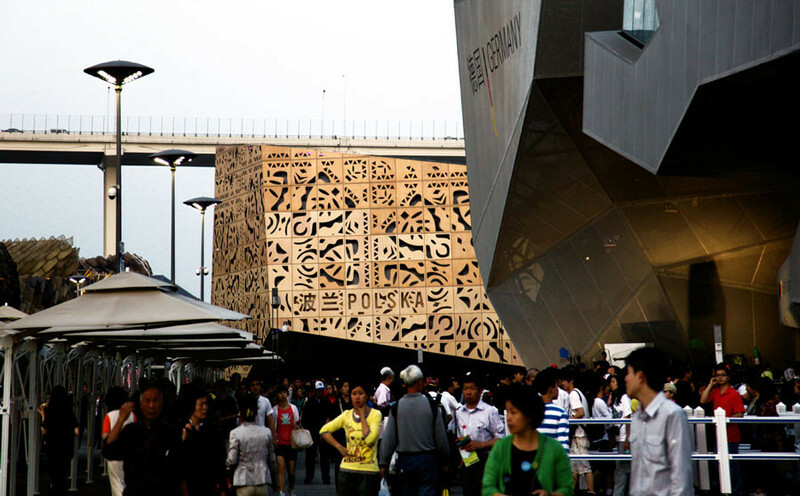 Auxiliary functions have been designed in the lowest part of the building, under the ramp leading onto the rooftop.Continuing the route the visitors enter the area of the exhibition proper, devoted to the future of the cities. The wooden, ground-level floor is gradually rising, acquiring the form of terraced stairs and becoming an auditorium for performances taking place below. The stairs take the visitors onto the mezzanine, where the exhibitions of Polish regions are to be located. Visitors on their way to the exit are passing by the restaurant and shop. 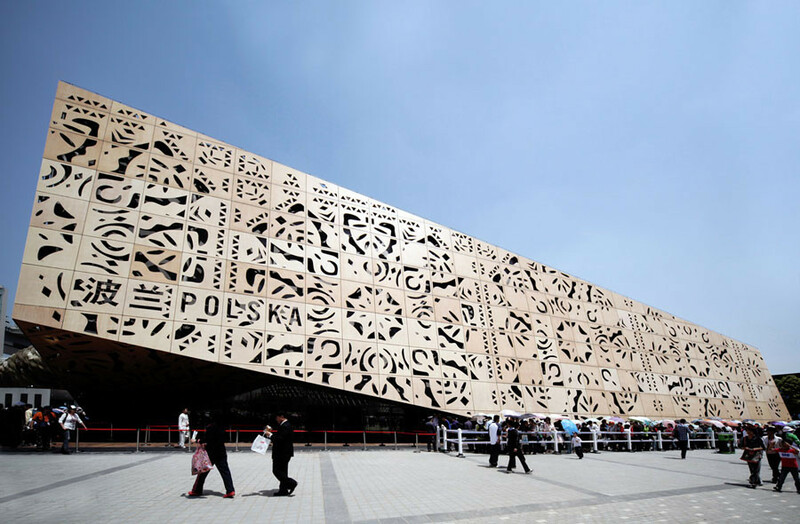 The outer layer of the elevation, with its characteristic design inspired by a traditional folk-art paper cut-out, is made of impregnated CNC-cut plywood mounted on steel construction modules with steel substructure. Both the exterior, entranceway surface and the interior of the pavilion will be covered with impregnated wooden flooring. The choice of materials and the character of construction were to a large extent dictated by the idea of possible future reclaiming and recycling of the pavilion structure or its parts, e.g. 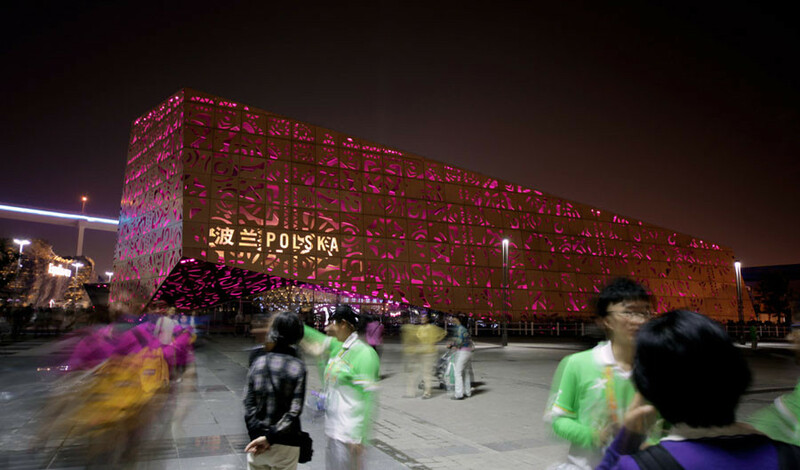 by reconstructing it in one of the Polish cities after the closing of EXPO. The colouristic effects were determined by the choice of plywood panels in natural wood colour. When the dusk falls the elevation will acquire different colours according to the changes of light penetrating the cut-out patterns. The entrance yard constitutes the integral part of the ground floor of the pavilion. 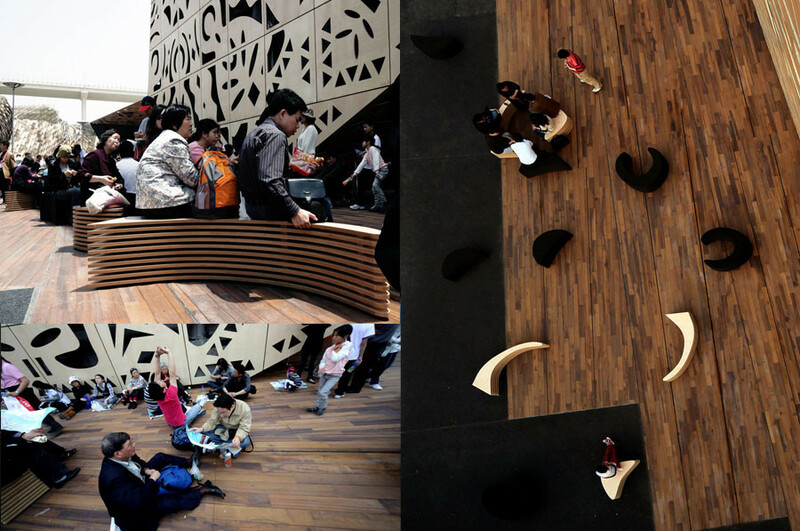 The pattern of the exterior flooring divisions as well as the material used are continued inside the building.The form of outdoor and indoor furniture has been inspired by the elevation patterns.There is a conception of using the elements cut out from the elevation plywood for producing the furniture, in the form and material which will directly refer to the pavilion architecture.